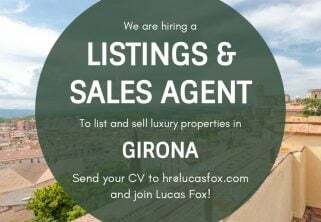 Thanks of our growth, we are looking for an International Sales Agent to join our team in Denia (Valencia) and to list and sell quality residential properties to our national and international clients maintaining Lucas Fox standards and values. Thanks of our growth, we are looking for an International Sales Agent – Dutch Speaker to join the Barcelona team and to list and sell quality residential properties to our national and international clients maintaining Lucas Fox standards and values. Do you have experience in the Madrid residential property market? Are you a hard-working and enthusiastic person that can work autonomously and in a team? Are you financially motivated and results orientated person? Lucas Fox is a specialist Real Estate agency offering exceptional properties and a full range of property services to international clients. Since 2005, the company brings a fresh, innovative approach to the luxury property business and a strong reputation for reliability, integrity and in-depth knowledge. Do you have experience of the luxury real estate sector? Would you like to form part of an award-winning international real estate agency? Are you hard-working, confident, financially motivated and results driven? This position is responsible to manage, train and coach an assigned sales and listings team to close deals and reach their assigned targets. This person will be in charge of the day-to-day management of the team on all aspects regarding their commercial role reporting the team results and performance to the founding partners of the company. Thanks of our growth, we are hiring a Residential Listing Agent to list quality residential properties in Marbella area to sell to our national and international clients. Due to our growth, we are looking for an International Real Estate Sales Agent to join our team in Marbella area to sell luxury residential properties to national and international clients. Lucas Fox International Properties, the leading Barcelona-based real estate company specialized in the sale of residential properties in Spain to national and international clients is looking for an Administration & Marketing Assistant Intern to join our office in Sitges. Lucas Fox International Properties, the leading Barcelona-based real estate company specialized in the sale of residential properties in Spain to national and international clients is looking for an Administration & Marketing Assistant Intern to join our office in Madrid.